Please note that for all subscriptions we need a three months cancellation time to the end of the year and volume. This means, that we extend the individual "yearly basis" subscriptions automatically when we have no cancellation received until the end of September. 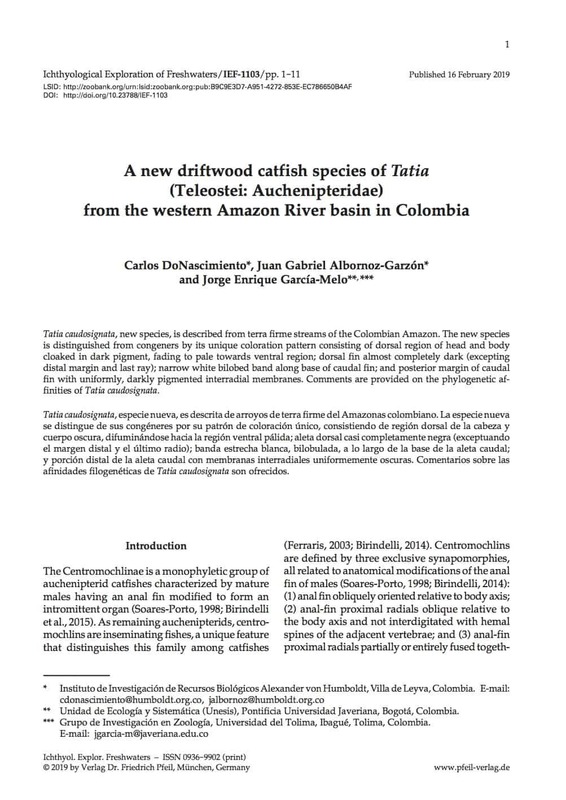 The aim of Ichthyological Exploration of Freshwaters is the rapid publication of papers resulting from field work in ichthyology and the documentation of the biodiversity of freshwater fishes: • taxonomic diversity • ecological diversity • ethological diversity • reproductive diversity • zoogeographical diversity The emphasis is on tropical environments and fauna, but papers on subtropical and temperate fishes are also regularly published. 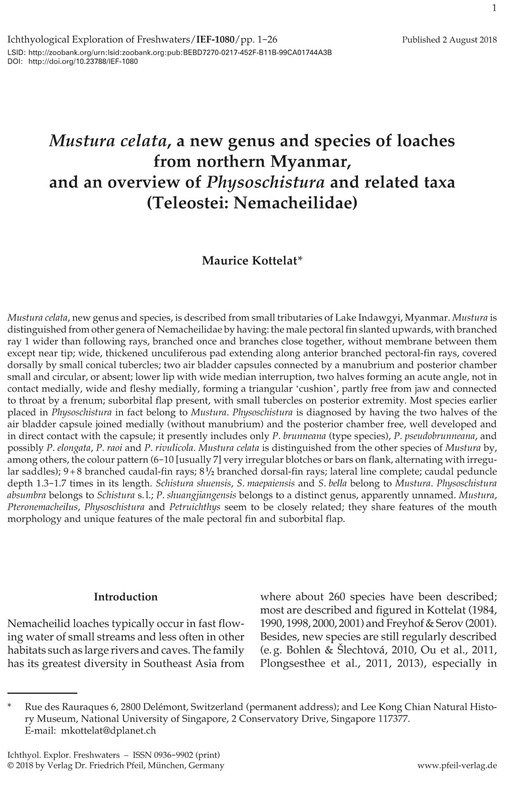 The main focus is systematics and biology at the organism-level. 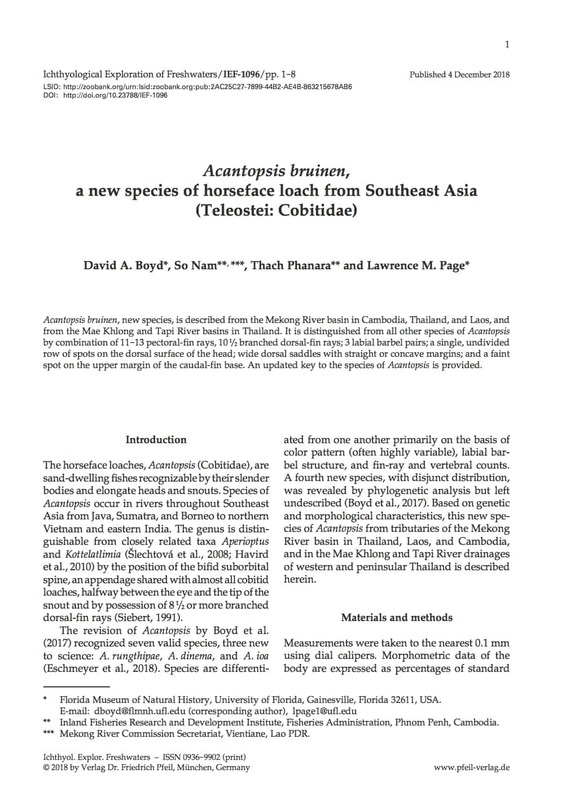 Although no single approach is proscribed, the following kinds of articles have been published: • descriptions of new taxa, systematic revisions, and identification keys; • ecology, ethology, and reproductive biology, preferably based on field observation; • zoogeography and exploration reports; • data on status of threathened or endangered species and biota. 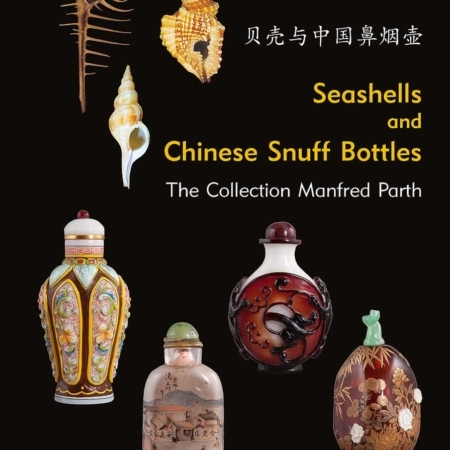 Four fascicles of 96 pages (17 × 24 cm) are published each year, including many colour illustrations. 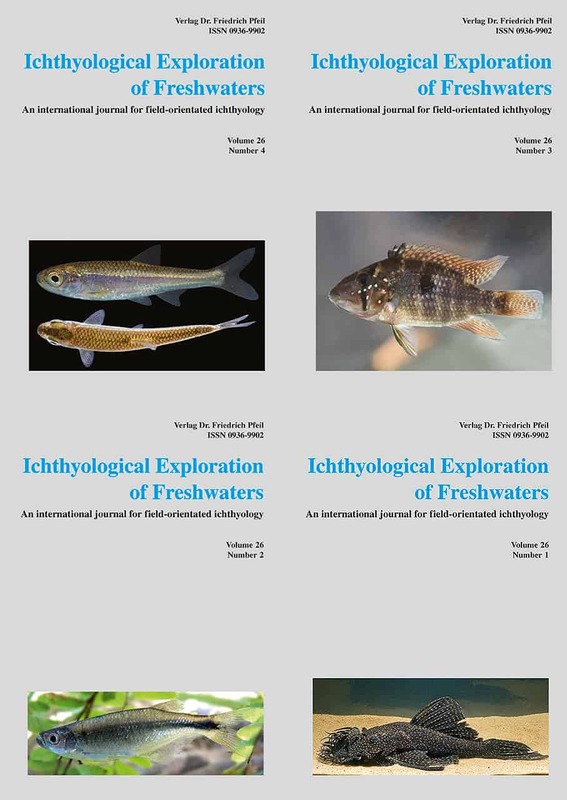 In the last 25 years (volume 1-25), Ichthyological Exploration of Freshwaters has published 779 papers, including the descriptions of 70 new genera and 923 new species of fishes from all continents, making it one of the most important ichthyological journals. 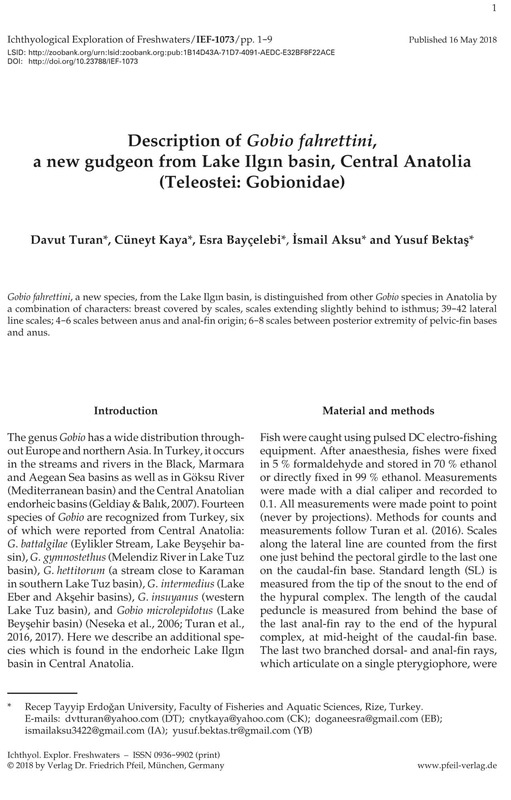 As from volume 14, issue 3, the title page of each article is presented as PDF file. 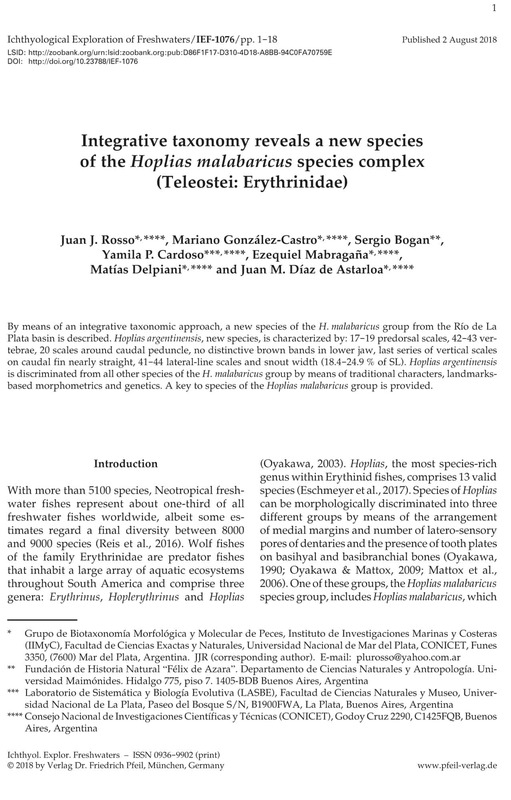 Selected contributions are available as »open-access« files. 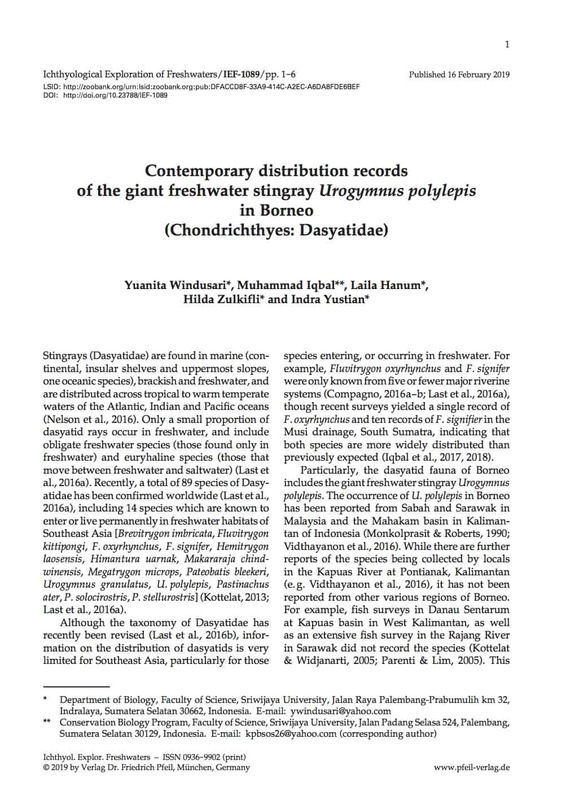 “Online first“ publication of manuscripts submitted and accepted for the journal “Ichthyological Exploration of Freshwaters”. Prospective authors should read carefully the following instructions and follow them when submitting a manuscript. Doing so significantly hastens publication and saves money and efforts. Manuscripts which do not satisfy the instructions below may be rejected at the Editor’s discretion and will not be returned. 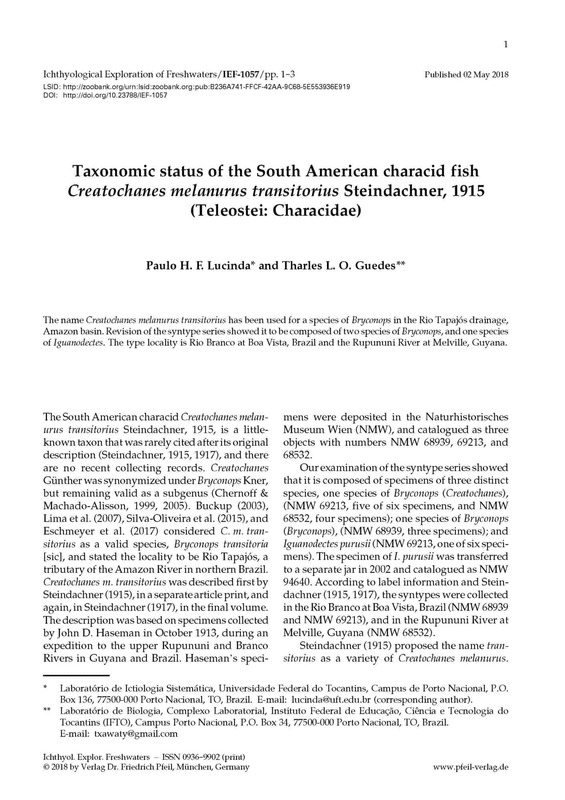 The original manuscript should be sent to the managing editor, Paulo H. F. Lucinda by e-mail: lucinda@uft.edu.br. 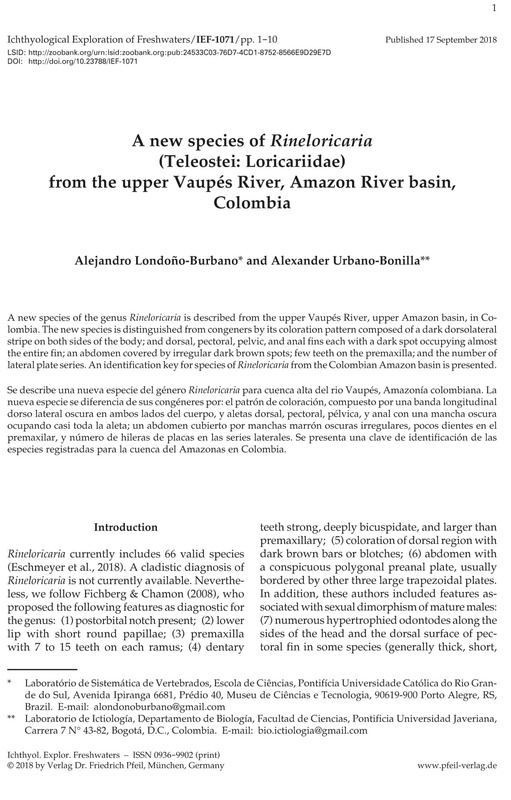 Additional information is requested: 1) the name, postal and e-mail addresses, telephone and fax numbers of the corresponding author; 2) the names, postal and e-mail addresses of up to four persons outside the authors’ institutions who are qualified to review the paper; and 3) a statement that the material has not been published and is not considered for publication elsewhere and that it will not be submitted elsewhere unless it is rejected or withdrawn. In submitting a manuscript, the author(s) accept(s) transfer of the copyright to the Publisher. 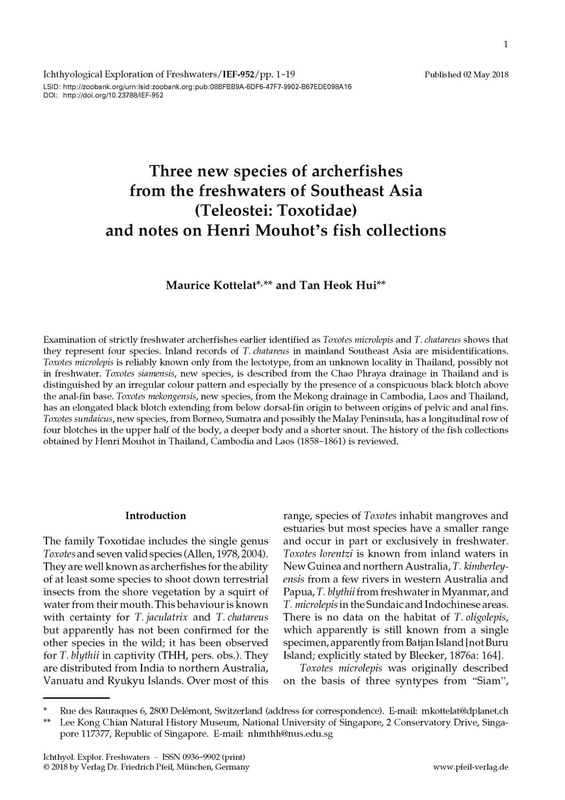 Ichthyological Exploration of Freshwater has become an important journal for publication of articles on fish taxonomy. We realise that publication in foreign journals can be a problem for authors whose first language is not English. Editors and reviewers have often provided assistance in correcting manuscripts, but in recent years we observe a sharp decrease in the quality of submitted manuscripts. This results in a sharp increase of the time needed to process manuscripts and it is no longer possible. It is the responsibility of authors to submit manuscripts that are linguistically correct and follow the style of the journal. If needed, authors should contact a company offering pre-submission editorial services for the revision of text and to bring them is standard acceptable for submission to the journal. The editors will amend your text but of course this will not be an opinion about the quality of the content. The descision on the suitability of a manuscript is the responsibility of the editors. Authors are those who have played a significant role in designing and conducting the research and in writing the manuscript. Individuals who have only collected data, provided material or financial support, or reviewed the manuscript should be listed in acknowledgments. Honorary authorship is not accepted. Co-authors should designate a single corresponding author to whom correspondence and proofs will be sent. All correspondence regarding the paper should go through the corresponding author. Correspondence will not be sent to other co-authors and correspondence from other co-authors regarding the manuscript will neither be answered nor taken into consideration. Files. The manuscript should be submitted in DOC or RTF format only. The text, captions, tables etc. must all be included in the same file. It the manuscript includes only a few illustrations, include them in low resolution in the word file. 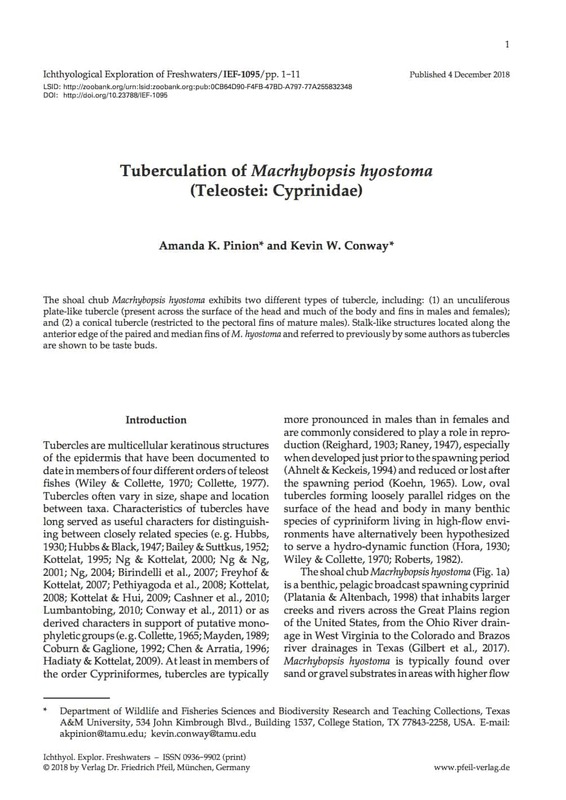 If the manuscript includes numerous illustrations they must be submitted in a separate PDF file; send all figures in low resolution and with caption in a single file. The files should be less than 8 MB. Text. All manuscripts are subject to editorial revision before final acceptance for publication. Nothing in the manuscript should be underlined. Titles with numerical series designations are not permitted. 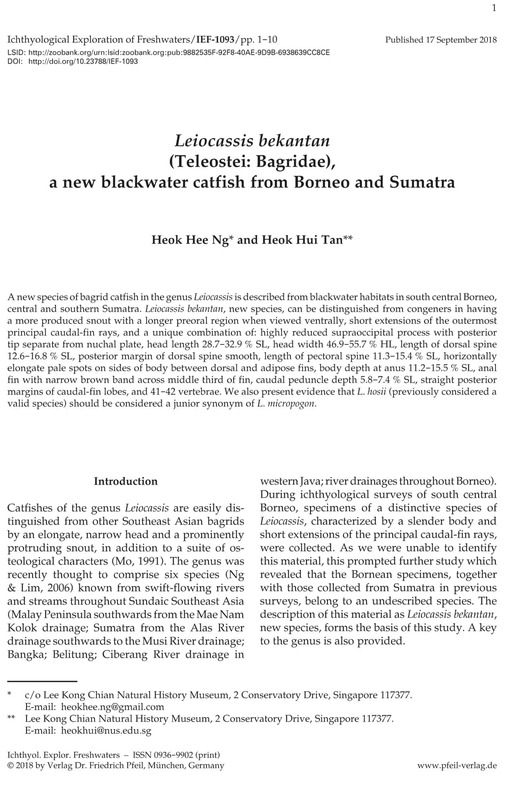 Titles should be brief, fewer than 20 words and should indicate clearly the field of study and the group of fishes investigated. All abbreviations should be explained in the Method section (or figure caption when appropriate) or a reference to published explanations should be provided; exceptions are very common abbreviations, such as mm, km, kg, sec, min, yr, vs., SL. Footnotes are not permitted. All measurements must be in metric units. 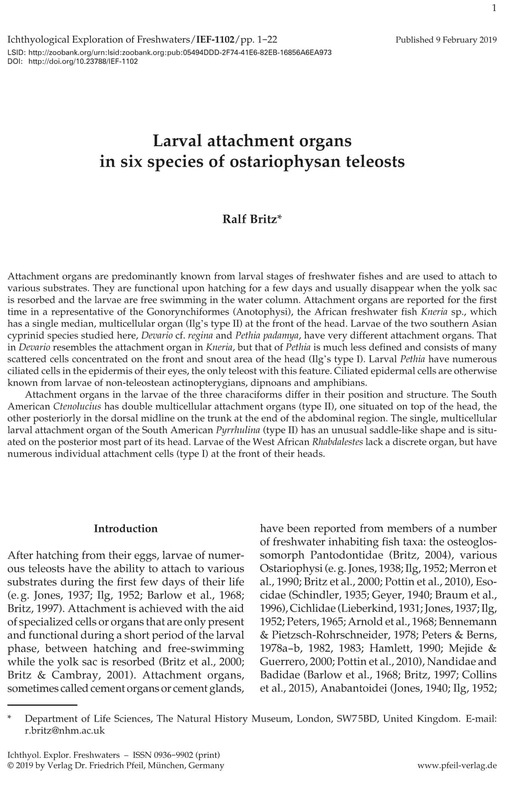 The first page should include: title of the paper, author(s), addresses and abstract, all left justified. The text should be followed by Material Examined (if appropriate), Acknowledgments (if any), Appendix (if any) and Literature Cited, in that order. 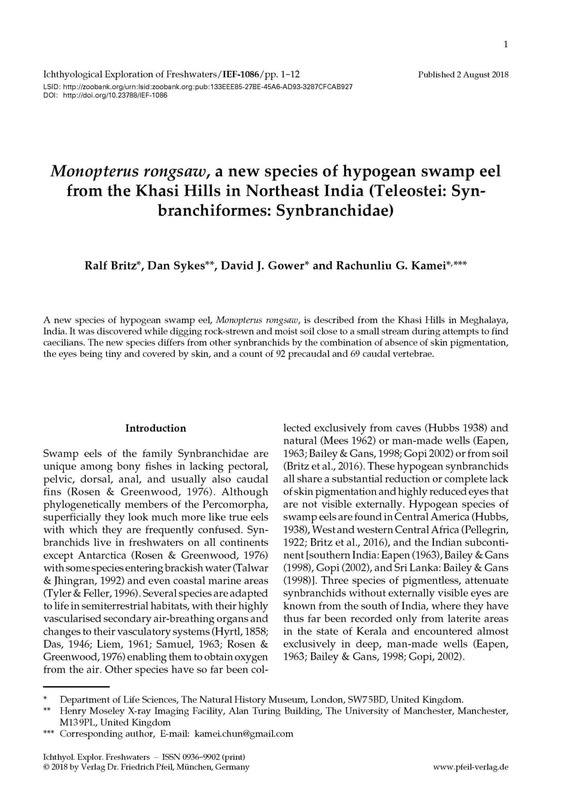 Keys are desirable in taxonomic papers. They should be dichotomous and not serially indented. Nomenclature. 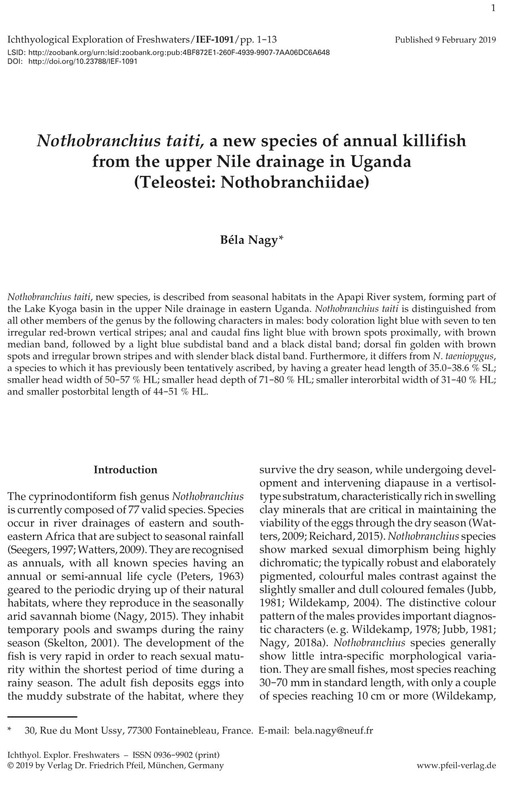 Names of living organisms should follow the appropriate and current International Codes of Nomenclature. 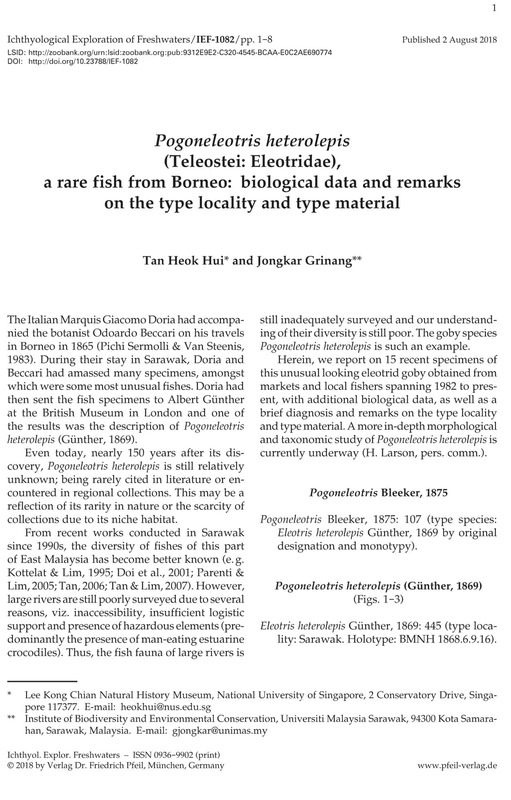 Only formal names of genera and species should be written in italics. 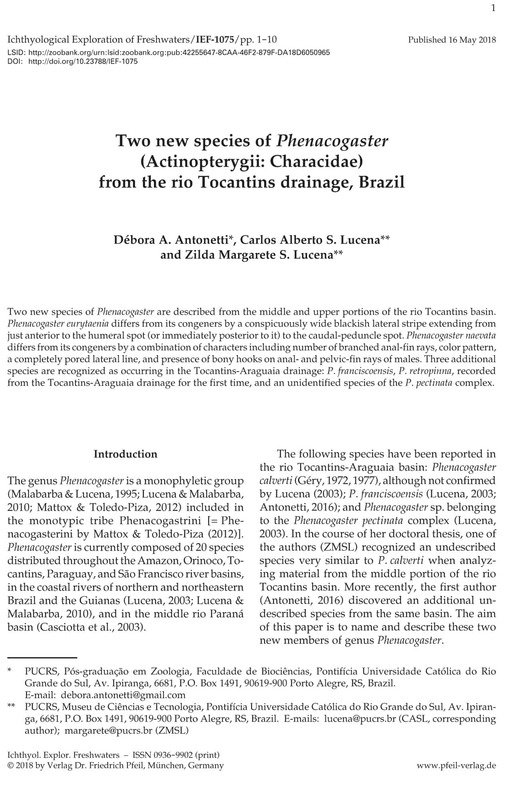 Names of authors and publication dates of scientific names should be mentioned once, in introduction or discussion, depending where most convenient, exceptionally as a table; bibliographical references must be included in the Literature cited section. Very old and classical works can be omitted if not absolutely justified. Language. Manuscripts should be written in English. 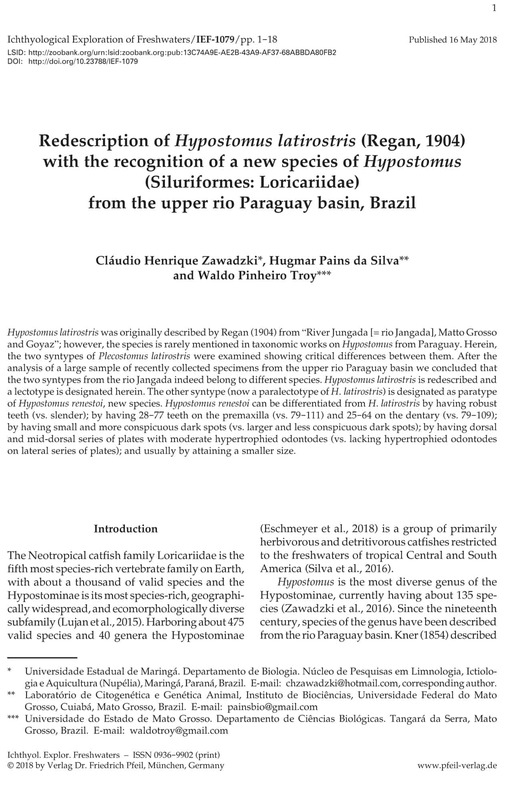 All papers must have a concise but informative abstract in English. 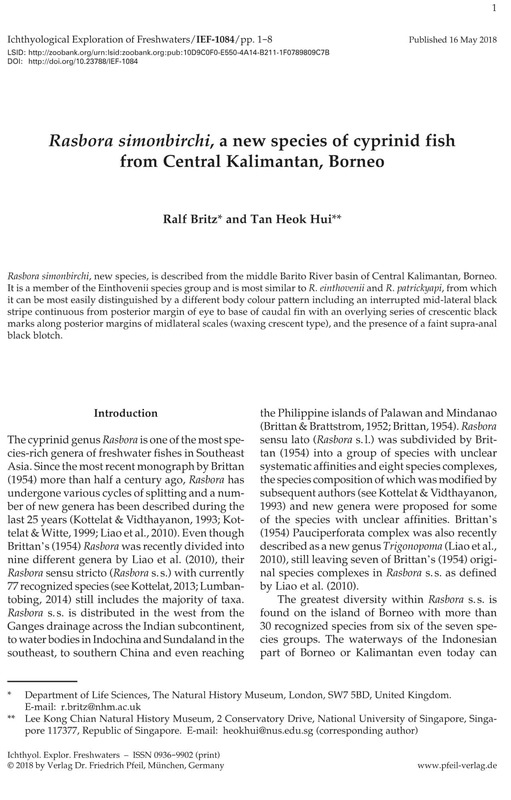 In taxonomic papers, the abstract must include at least clear diagnosis of the new taxa. 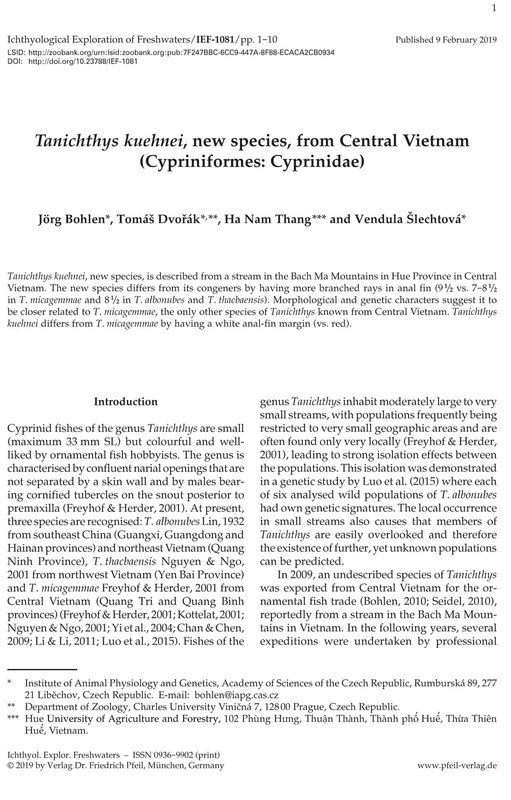 This maybe omitted for papers including the descriptions of many new taxa; consult the editor first. 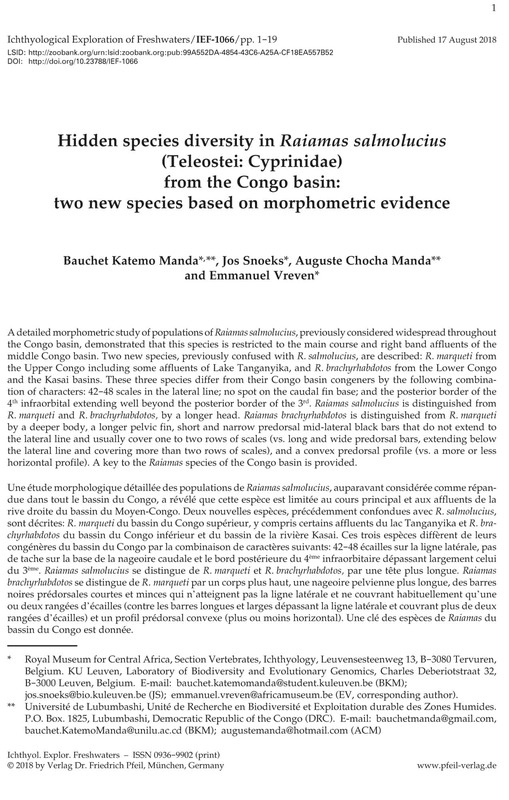 A second abstract, provided by the author(s), in the language of the country or area concerned by the text is acceptable. A maximum of two abstracts is permitted. Acknowledgments. Identify individuals by first name(s) and surname. Do not list titles, position or institution. Acknowledge individuals, not positions. Idiosyncrasy and private jokes are not permitted. Literature cited. 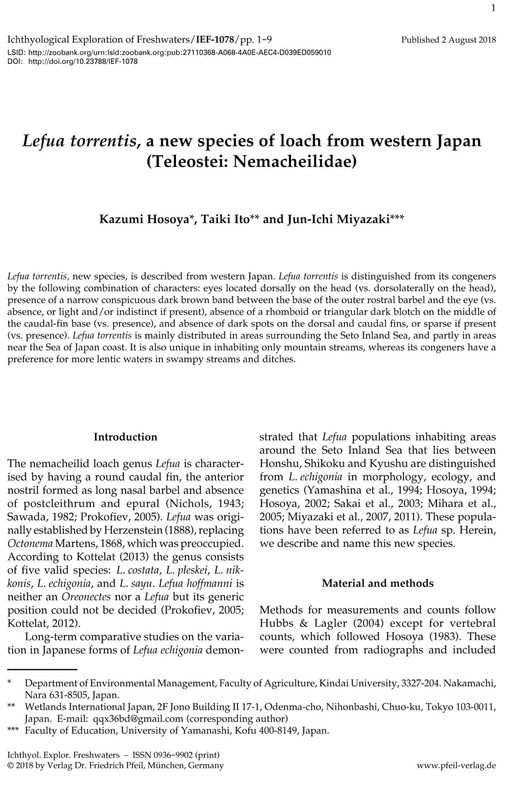 Format for Literature Cited is that of the most recent issue. Do not abbreviate the names of journals. For books, give full name of publishing company or institution, and city. Manuscripts in preparation, abstracts, in-house reports and other literature not obtainable through normal library channels cannot be cited. In-press manuscripts can be cited only if they have been formally accepted. Tables. Tables should be included in the text file, at the end. Use Word format and do not anchor them. Tables must be numbered sequentially with Arabic numerals; they should have concise but self-explanatory headings. Do not insert frames, vertical rules, dotted lines or footnotes. The location of first citation of each table should be clearly indicated in the text. Figures. Detailed instructions for the preparation of digital images are here: https://pfeil-verlag.de/div/eimag.php. 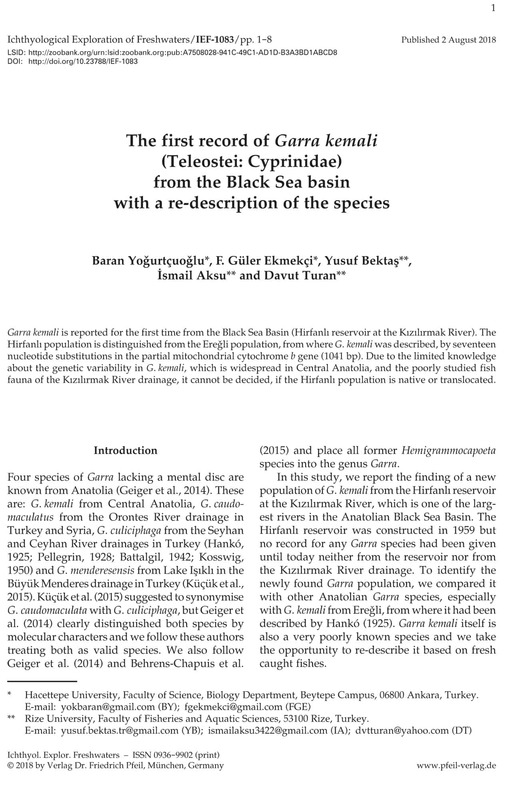 For the submission of new manuscript only low resolution copies are needed. Do not send large files at this stage. Case by case, if needed, we may ask you to send the original files at the time of submission. All maps, graphs, charts, drawings and photographs are regarded as figures and are to be numbered consecutively and in the sequence of their first citation in the text. When several charts or photographs are grouped as one figure, they must be trimmed and spaced as intended for final reproduction. Each part of such a group figure should be lettered with a lower case block letter in the lower left corner. Where needed, scale should be indicated on the figure by a scale bar. All illustrations should be designed to fit a width of 68 or 140 mm and a depth no greater than 200 mm. Lettering should be large enough to be easily seen when reduced onto a journal column (68 mm). If a vector-graphics program is used, the original files saved by this program and all linked files must be submitted. Do not export or save the figure in a different format (for more details see the informations on https://pfeil-verlag.de/div/eimag.php. If line drawings are scanned, the resolution must be 1200 dpi or more and the format must be bitmap (1 pixel = 1 bit). If halftones are scanned, the resolution should never be lower than 400 dpi, applied to a width of 14 cm, even for photographs designed for column width. Photographic prints and slides and original drawings must be scanned for submission. We will ask to send the original after acceptance of the manuscript. Colour illustrations should preferably be submitted as slides (photographic slides, not slides prepared by a printer). Digital images should be only unmodified (raw) data files as originally saved by the camera or the scanner. If the data files are modified, a copy of the original, unmodified file should be submitted too. The decision to print in colour or in black and white any figure originally submitted in colour remains with the editor and publisher. This decision will be based on scientific justification, quality of the original, layout and other editorial, financial and production constraints. By submitting colour originals, the authors know and accept that they may be published in black and white. Each manuscript will be sent to two reviewers for confidential evaluation. When justified, the reviewer’s comments will be forwarded to the corresponding author. When submitting a revised manuscript, authors should briefly indicate the reasons for disregarding any suggestion they consider unacceptable. Remember that if a reviewer had questions or did not understand you, other readers may make the same experience and the answers should be in the manuscript and not in a letter to the editor. Changes in style, format and layout requested by the Editor are non-negotiable and non-observance will result in rejection of the manuscript. Revised manuscripts received more than 6 months after the reviewers’ comments had been sent will not be considered or will be treated as new submissions. A PDF proof file will be sent to the corresponding author; it should be checked and returned to the Editor within one week. If corrections are not received within this delay, they may be done by the Editor, at the author’s risks. Authors may be charged for any changes other than printer’s error. Reprint orders must be forwarded with the corrections. The corresponding author is responsible for contacting the co-authors and forwarding their reprint orders. The authors will receive a PDF file for personal use free of charge; high-resolution PDF files for unlimited use may be ordered. There will be no page charges and no charges for justified colour illustrations.